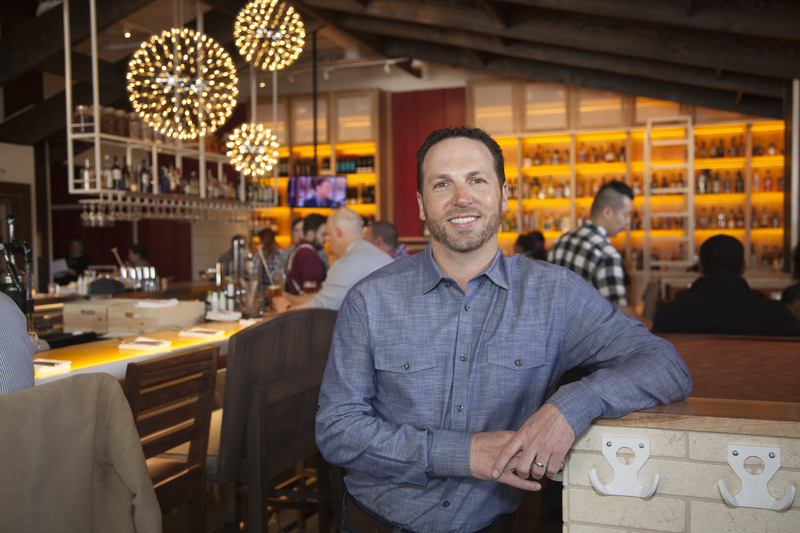 For some owners, restaurants are all about the business, about making money, or even about basking in the spotlight, accumulating accolades and being the best of the best. For others, it is simply about producing good food and drink. For Dan Simons, it is all of that, and more. Restaurants are a microcosm of society, and a dynamic foundation to face some of our planet's most pressing and interesting issues, from food sources and quality, to protecting the environment and the communities in which we live and eat, to creating equal footing and career paths for hard working and dedicated employees. Apparently, this full package approach is working. Dan Simons, and his partner, Michael Vucurevich, are leaving a noticeable impression on the restaurant industry. With over 60 percent of restaurants failing in their first year alone, their Farmers Restaurant Group is defying those odds as they ramp up to open three more restaurants in their popular farmer-owned brand in the next year, including one that houses an in-house distillery. In addition, Dan leads a top tier consulting firm in the restaurant and hospitality space. Coming from a European background, with family emigrating from England and Austria, Dan's parents were always fascinated with and embraced the "anything can happen in America" attitude. Dan attributes this to part of his success, and he uses his parents' motto to shape his restaurants, his consulting, and his life. It helps him go after what he wants, without compromising his own values, because he was taught if you do what you love, you'll do it well, "anything can happen." Why not just go for exactly what you want. Part of what Dan and his team do in their own restaurants is to work to clarify their vision and their brand, and ensure they are matched across the company's core strategies and business planning. For the Farmers Restaurant Group, this is not a stretch, because their brand is very closely aligned with Dan's own personal core values, which include: treating your people with dignity and respect and giving them an even footing; food source matters; the environment is our home, so we best take good care of it; and people come to restaurants for more than the food. Dan says, "If we stay authentic to what we believe, and make the equation about our people, our principles, and our vision, the profit takes care of itself." From his parents to his mentor-now-partner, Michael Vucurevich, over the course of his life, Dan has had people believe in him and help him succeed. He's been paying it forward all along the way. The restaurant business can be fairly hierarchical and competitive in less than straightforward ways. So many people feel like they are in a dead-end job with no future prospects. In some ways, Dan and his team have revolutionized the industry with their coaching and mentoring strategies. In conversation after conversation with his team, Dan reminds them to never look up at anyone, but instead, to look across the table, eye to eye, with the confidence that all people are equal. This might sound like executive coaching or leadership training, but this is the guidance Dan gives to every employee, from the dishwasher struggling to learn English to the bartender working two jobs to pay of his student debt after getting a Masters and not yet finding work in her field. It is this approach to helping people see the best in themselves, "to bloom" as Dan says, that has created a culture of intense loyalty at his Farmers Restaurant Group. Dan's commitment to developing people can be seen when he is side by side coaching in the restaurants and in classroom settings where he spends hours every month teaching small groups the curriculum he has developed for personal productivity mastery. Fine-tuning employees to help them understand themselves better makes for a happier and more productive environment that Dan sees directly related to higher customer ratings on reviews and producing more profit. There is definitely a thrill in Dan's eyes when talking about dishes and cocktails and service touch points, but what really gets him excited are food sources. Dan stays true to serving food with quality, healthy ingredients, which he attributes to that "at home" feel. But this is not your typical farm to table story. It is conscious capitalism. Disassociating from the industrial food supply chain, Dan promotes quality, made-from-scratch meals paying very close attention to his suppliers and the source of their food. Partnering with over 42,000 farmers of North Dakota, along with a handful of other farm organizations and individual farmers, influenced Dan and Mike V to coin the phrase "through the eyes of the farmer" as the basis for a mind-map and decision-making process they could teach to their Chefs and Managers. This has led to an enterprise that takes specific steps to invest in its local community, its people, and to think long term with suppliers and producers, while offering unparalleled autonomy for the top leaders in the company, most of whom are women. Talking with Dan, it becomes clear that he is proud of his work, and he should be. The Farmers Restaurant Group runs some of the greenest restaurants in the country. Dan makes building and running the restaurants with green methodologies--such as solar panels are planned, energy efficient kitchen equipment, and restaurant-wide recycling and composting programs--a high priority, investing in third party certification with agencies such as the US Green Building Council for LEED and the Green Restaurant Association to verify to customers that he promotes a healthy restaurant. While it takes a lot of work and financial commitment, it aligns directly with their vision and their restaurant plan, and gives guests yet another reason to stop by for a meal. Coming from a strong family background, Dan understands the importance of people coming together to make memories, the psychology and values of spending time with loved ones. He also believes that restaurants that make memories are also the restaurants that get people to return. This drives Dan's precise focus on the atmosphere of each restaurant, the balance of table placement, lighting, and overall vibe that allows the guests to relax and soak in their environment and immerse with their dining companions. Good business owners want to see what their customers see, which is especially important in the restaurant business since every seat has to convey good emotions. Dan sits in every seat in the dining room to ensure he stays current with the view of his guests. Sometimes he makes a minor adjustment, sometimes more, all of it working to ensure the guests have a shot at what he calls "the perfect experience." He wants every customer to come back again. And they do. So does his family. One of Dan's metrics for success is running a principle-centered business where your kids and their friends and families want to eat and work. When regular customers recommend their children get jobs at the restaurant, it is a clear indication to Dan that they have created exactly the right environment. Dan Simons is a successful restaurateur. He and his team are cooking up a storm in the restaurant industry in an around the Washington, DC area, rewriting some old formulas for success with some recognizable ingredients and some new ones. It is both inspiring and impressive. It is definitely a recipe worth considering, with lessons that can be applied across a wide range of industries.